Chinese At-large community unaminously agreed at the meeting on April 11, 2013 to submit the following statement to ICANN. We are very disappointed at the implementation model outlined by “Trademark Clearinghouse: Rights Protection Mechanism Requirements” (hereafter “Requirements’) published on April 6, 2013. Particularly, the model completely overlooks the critical issues of IDN variants with respect to trademark clearinghouse (TMCH) and as a result would seriously impact the public interest in the pertinent user communities. According to the Requirements, matching domain name labels will be generated for each Trademark Record in accordance with the Trademark Clearinghouse’s domain name matching rules. The matching rules at the TMCH obviously, however, fail to take into account the trademarks in IDN scripts involving variants, although the variant issues had been raised by the language community experts at the Implementation Assistant Group (IAG). Variant matching is actually critical for certain language communities. Take Chinese for example, a trademark holder may have registered a word-mark in simplified characters but it is unlikely to register the same word-mark in traditional characters and absolutely unthinkable to register in a mixed-up character setting. In this case, there will only be one trademark record generated in the TMCH. Since the new gTLD registries are obliged to offer sunrise services and trademark claims for the trademarks recorded in the TMCH, only that simplified word-mark will be eligible for sunrise registration and trademark claim services and leaves all other “variants” open for cybersquatting. Ruling out the un-registered word-mark variants would make TMCH completely useless to Chinese trademarks. What is even more striking is that the Requirements specifically prohibits any registry from implementing variant or bundling rulesand allocating domain names under such variant or bundling rules prior to the conclusion of the Sunrise Period. Such restriction actually excludes any solution for IDN trademarks involving variants to be accommodated in the sunrise period at the TLD level, even though a registry is willing fix the variants through its registration management and at its own costs. Trademarks have very important function of safeguarding public interests by identifying the source of goods or services. The malfunctioned TMCH design would cause serious public confusion and market chaos. The consequence will be even more serious regarding the trademarks in the fields of banking, insurance and other high-secure businesses. Although at-large community never supports over-extensive trademark measures, ICANN should treat all the trademarks equally, irrespective of the characters of the trademarks, and protect the users in all language communities from confusion equally. If ICANN is even willing to protect 50 “derivations” that are DIFFERENT from a trademark per se, why does it refuse to entertain the SAME trademark in variants. This is illogical by all means. On the other hand, all 50 derivations, if applied to a Chinese-character trademark, will all involve variant issues definitely. 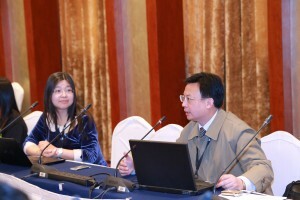 The Chinese Internet user community, dating back to October 2011, suggested that IDN-script trademarks involving variants should be taken into account in the TMCH services and ICANN consider adopting community-based solution to address this issue. Many other language communities shared the views of Chinese community. Unfortunately, ICANN has been deaf to the user community’s feedback and inputs and moves steadily toward the centralized, inflexible and variants-unfriendly TMCH. At-large community, therefore, strongly suggests that ICANN support community-based TLD-bottom-up solution for TMCH implementation and address the IDN variant issue before TMCH provides the services to the new gTLD registries. IIPL/CDNUA has made substantive contribution to the ICANN policy making, although it is not easy to penetrate the exclusive west-centric club in eco-system of civil society. Although civil society from the South often feels that their voice are bounced by the sound of silence, they are still engaged and talking. Here are the aggregation of the comments made to a variety of policy issues. this round. So it does not make much sense to draft a statement on this. What I discovered interestingly is that all new gTLD applicants should submit their PICs by March 5. There are 3 sections in the PICs. Section 2 is for applicants to indicate which parts of their applications they will incorporate into their registry agreements as binding ommitments. If an applicant did not submit its PICs, only Section 1 applied to its base agreement by default. To my memory, when RALOs considered those objection statements, some applicants urgently provided their PICs on either Section 2 or both Section 2 and 3 to appeal to RALOs’ support. But those so-called commitments, if later than March 5, may only be rhetoric to at-large but not “valid” PICs to ICANN. any specific applications and consider whether or not to comment on their sufficiency and effectiveness of securing public interest. PIC DRP, which modeled on the PDDRP for trademarks, is a flawed system, in which ICANN struggled between its dual roles as the TLD regulator and at the meantime the contractual party with the TLD operators. Although, understandably, ICANN has no regulatory authority except through the contractual relationship with TLD operators, it is not a fix to mix both rules up. As a contractual party, ICANN should enforce the contract without relying the third party’s complaint. As a regulator, ICANN should be able to judge whether a breach of commitment occurs without outsourcing the assessment to a DRP proceeding, which is both costly and with high bars. We can only hope that the compliance against new gTLDs’ PIC would not be diluted by this new DRP proceedings. loud against the 50 variations to include “translation” or ”transliteration” of any mark although its “abuse” has been recorded in previous proceedings. There would be ridiculous results particularly where these marks are generic terms, like APPLE, SUN or DOVE. If taking into account the same or similar marks registered in different class and country (like Havana Club registered in both US and Cuba by different parties), 50 variations are simply opening a can of worm. Even if this is merely for sunrise and claims, the chaos would be unimagineable. I noted IPC/BC’s proposal at IGF week and had a sense that they were making substantive demands to expand the RMPs that have been written down. Your message actually confirmed my guessing. been announced? And had at-large been able to involve in it? it referred back to GNSO? law). They are all purely trademark measures. UDRP only covers trademarks or service marks. New gTLD trademark measures (URS or TMCH) covers: registered marks, marks protected by internaitonal law (such as Parma Ham) or marks protected by special decrees (such as Champagnes). As I stated before, a broad “IOs” concept is adopted (rather than sticking to exclusive IGOs) and the legal nature of RoC or IOC is clarified. registration, and all protection measures at 2nd-level are for trademark, which makes the IGO names’ protection unbalance at top-level and second-level. If a dispute resolution policy could be developed to enable IGOs to complain against abusive registrations at second level, it would be good idea. But I object to changing the current policy at this round and setting out a priorly-reserved name list, let alone merely singling out 2 IGOs for special treatment. organizations (NGOs). So, if there could be a holistic solution (DRP or else), it should cover all International Organizations (IOs), including international NGOs and IGOs. If we stick to the term IGOs, it could be no solution for IOC or RC at all. “closeness” of the community-based TLDs. Currently, all the application committments are yet to be included in the delegation agreement and thus will not be subject to the “compliance” mechanism. Should ICANN change this Laissez-faire approach, generally or specific for closed generic TLD strings? I think ICANN should have a holistic view.